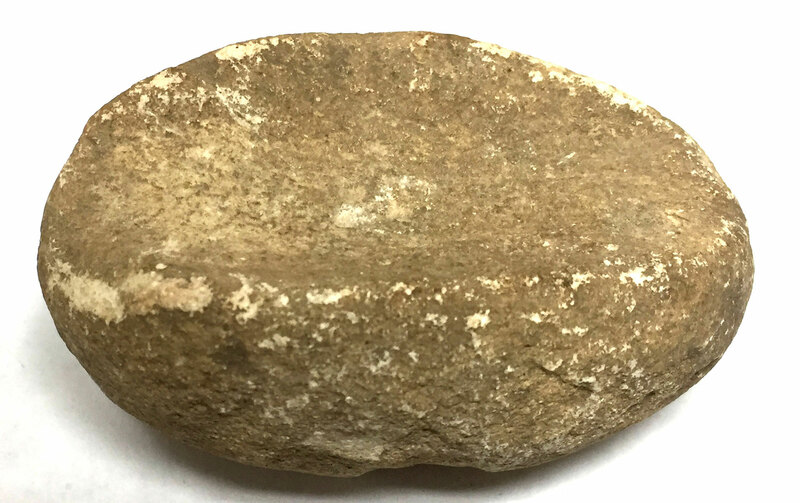 A Small To Medium Size, Visibly Aged And Anciently Made, Well Made Limestone Boatstone That Exhibits Heavy Surface Aging And Overall Stone Patination, Heavy Aged Soil Deposits, Correct Exterior Pecking And Polishing Groove Manufacture, Correct Material And Manufacture For The Area Found. Found By Jeff Christian In The 1960 s, In A Rock Shelter Close To The Buffalo River, Near The Community Of Ponca. This Unusual Boatstone Has Been Grooved On The Top With Both Ends Open, Not Being Cupped As Most Examples, Displaying Movement Use Wear On The Bottom Of The Stone. Includes A Ken Partain Certificate Of Authenticity.